Just because something has been said in some mad fit of coked-up hyperbole doesn’t mean that it can’t also be true. The Matrix sequels mark the precise spot where the barrier of technology for live-action cinema was finally and irreversibly removed. Once it was possible to stage convincing sword fights on the roofs of heavy goods vehicles there were no limits to what could be depicted on-screen. Silver was right: the bar had been raised so high that it no longer existed. Providing that they had a large enough budget, film-makers were able to make whatever they wanted. The concept of the modern blockbuster was born in 1975 when a film starring a malfunctioning shark and an insufficiently large boat became the highest-grossing motion picture of all time. In the nearly four decades that have passed since Jaws’ unprecedented box-office achievements (swiftly dwarfed by Star Wars two years later), blockbuster movies have become the “tent poles” around which major film studios construct their production schedules. While an increasing emphasis on spectacle was inevitable – Jaws, after all, doesn’t even fully show its selachian villain until 81 minutes into the film – over the past fifteen years this has gone hand in hand with a systemic bloating of both content and running times. Where the average length of the top 10 highest grossing films of the 1990s was 132 minutes, the average for the 2000s was 154 minutes. A sea change has taken place: to get a project green-lit with the sort of budget demanded of a big summer blockbuster the film must now boast a running time that would have once required an intermission. Lean, efficient blockbusters like Men in Black (98 minutes) and the first X-Men(104 minutes) are almost unimaginable today. The rapturous critical and commercial success of Titanic in 1997 can shoulder a little of the blame for blockbuster film-making’s descent into exorbitance, but the real catalyst was The Lord of the Rings. Formula-repeating, money-vacuuming sequels have always been a predilection for studios, but after Peter Jackson’s three-film opus grossed nearly $4 billion worldwide a movement towards monster-sized trilogies began. Without rich source material like J.R.R. Tolkien’s twelve hundred pages of Middle Earth follies to draw upon, however, the power of satisfying one-offs like Pirates of the Caribbean were diluted by overlong sequels and bogged down by convoluted plotting and endless action sequences. Jackson himself fell prey to the temptation to expand unnecessarily when his adaptation of the 310-page children’s book The Hobbit unfathomably bloated into three enormous films in an attempt to emulate his earlier accomplishments. As the films have become bigger, the possible forms they can take have narrowed. A blockbuster that can’t potentially birth a franchise has little value, irrespective of its other qualities. Not only is any picture with a budget over $200 million expected to be an epic in length, such films are now also required to anticipate at least two potential sequels, regardless of whether the story (inevitably pulpy and genre-based) can support this or not. While it’s understandable that a well-received and financially successful film might spawn a follow-up, the amount of effort many blockbusters put into world-building makes them feel like feature-length advertisements for their own sequels rather than distinctive pieces of popular entertainment in their own right. This trend seems likely to burgeon further still as the major film studios – emboldened by the enviable profitability of the Marvel Cinematic Universe – look for ways to tie properties together in a similarly gargantuan, synergy-promoting manner. Even though there has been an undeniable pleasure in watching Marvel Studios skilfully weave the warp and weft of its epic superhero tapestry over multiple franchises, their use of intensive serialisation and rigid commitment to an enjoyable-yet-cautious house style (this summer’s Guardians of the Galaxy proving a joyful exception to the rule) makes it very difficult for their films to be genuinely surprising. Creating nine motion pictures that are mostly good-to-excellent is commendable, but their consistency can’t disguise the creeping sensation of exhaustion. The tendency to engorge blockbuster films beyond their natural size has only been exacerbated by the strides made in CGI over the past twenty years. Once genuinely astounding, sequences like the battle that opened The Fellowship of the Ring are now commonplace. A few of the Harry Potterfilms aside, it’s difficult to think of a major blockbuster from this millennium that hasn’t featured either a gigantic battle or a city being destroyed, often at the same time. Such sequences provide diminishing returns as the sight of computer generated figures waging war against each other rapidly loses its attraction. In trying to top each other with their bombast and magnitude, such films become less distinctive, their impact dulled by visual noisiness. Accordingly, the third acts of many modern blockbusters are largely interchangeable: does it really matter if the CG buildings are being destroyed by Superman or some Transformers; by a crashing starship or one of a dozen Marvel superheroes? The troubled state of contemporary blockbusters doesn’t deprive them of value. There remains a number of incredibly talented film-makers who manage to create interesting work despite being unable to entirely break free from dominant conventions. Until its skirmish-heavy, building-destroying conclusion, Dawn of the Planet of the Apes is bleak, thoughtful, intelligent and gripping, while Godzilla director Gareth Edwards’ lengthy withholding of the eponymous reptile’s first appearance overtly channels the work of Steven Spielberg. Even 2012’s Avengers Assemble is a good example of a contemporary blockbuster that works despite being a colossal mess. Regardless of that film’s many positives, however, it could have undoubtedly been improved by a tighter narrative and less generic action. It’s not insignificant that the most memorable moments take place in the comic interactions between characters rather than any individual set pieces. An interesting thought experiment: aside from Tom Hiddleston’s Loki, what do the other enemies in Avengers Assemble look like? Would you be able to draw one from memory? What actually happens in any of the action scenes, beyond people flying or hitting each other? Confronted by widespread piracy, the terminal decline of physical media sales and attendant rise of streaming options, ever more sophisticated home entertainment systems and a booming era of television, the appeal of supersized blockbusters for film studios is obvious. Keen to discourage the growing allure of home viewing, studios focus their efforts on producing films best experienced in a cinema, ideally by purchasing a more expensive 3D or IMAX cinema ticket. This means that the major film studios are making fewer films and the ones they are making are aimed at as broad of an audience as possible. The problem with this strategy is that as the studios spend hundreds of millions of dollars making and marketing a handful of films, the risk increases exponentially: Disney’s underwhelming John Carter had a budget so gigantic that it had to become one of the highest grossing films of all time in order to make its money back. When a film has to earn over a billion dollars to avoid being considered a flop then something in the industry has gone wrong. This level of risk incites predictable caution, leading to the exclusion of original screenplays in favour of a near-talismanic dependence on pre-existing properties with any semblance of audience recognition, from sequels to reboots to the adaptations of board games. The propensity for studios to place all of their financial eggs into a couple of cinematic baskets each year also has ramifications across all of film-making, as the diverse range of mid-priced pictures that studios used to make now struggle to secure funding. If such films are made at all they’re often stuffed into a vicious few months at the end of the year, doomed to be ignored and forgotten if they don’t pick up immediate Oscar buzz. For all the damage that this endemic bloating has had on the film industry, it’s the blockbusters themselves that have suffered the most. It takes the viewing of another of Spielberg’s superlative blockbusters to see how things have gone awry, and to contemplate a possible road back. Re-watching Jurassic Park twenty-one years later, a dozen of them filled with increasingly distended blockbusters, what’s most striking is how elegantly constructed and efficient the film’s narrative is. It’s easy to imagine that if the film had been made today it would be a shapeless, three-hour-long muddle, lousy with subplots and gratuitous destruction. Instead, Jurassic Park spends its first half patiently establishing its world and characters before the park’s security system shuts down and hell breaks loose. Even after that cataclysmic event, David Koepp’s screenplay takes efforts to space out the action scenes, interspersing them with moments of character development and reflection. By exercising restraint, Jurassic Park avoids the sort of fatigue that besets anyone trying to make their way through a Pirates of the Caribbean or Transformers film more than once. Aside from an unfortunate outdoor toilet no buildings are destroyed, there are no indistinct crowds, and each scene features only a handful of characters who spend much of the film in immediate danger. 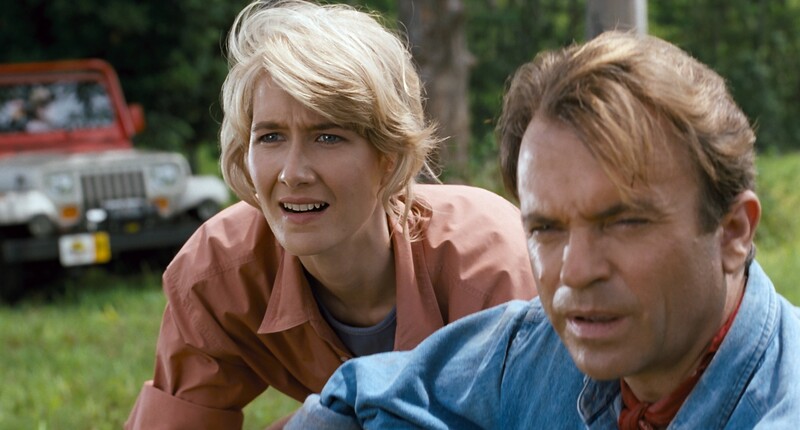 Populating its story with easily-injured humans rather than superheroes, Jurassic Park provides actual stakes: the world isn’t at risk, but the protagonists are. Almost every aspect of Spielberg’s film seems to now stand as a rebuke to prevailing trends in blockbuster film-making. Despite being commonly seen as a turning point in the development of CGI, only 80 shots in Jurassic Park actually employ computer-generated effects – by contrast,Avengers Assemble features over 2,200 visual effects shots. In using the technology so sparingly, relying on animatronics, long shots and sequences set at night, the film’s effects hold up remarkably well. Even if technical limitations played a part in deciding how its threats were depicted, the austere usage of CGI enhances the audience’s sense of both wonder and fear: a single Tyrannosaurus Rex is scarier than hundreds of them. Like its dinosaurs, each of Jurassic Park’s action sequences are memorable and distinct: the night-time T-Rex attack, the race to turn the security system back on, climbing the fence, the raptors in the kitchen. Excluding Hitchcock there has probably never been a director more gifted at staging set pieces than Steven Spielberg, and their impact throughout Jurassic Park serves as a reminder of how much more effective a blockbuster can be when it isn’t just lurching from one giant fight to the next. 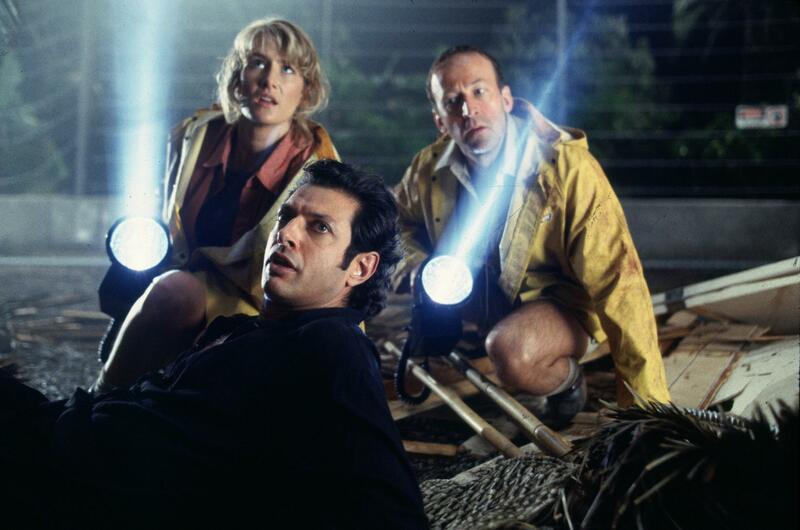 After twenty-one years of unrelenting technological advances Jurassic Park has inevitably lost some of its capacity to astonish, but regardless of how far CGI develops the film will remain a fulfilling undertaking because it’s a good story, well told. Disappointing sequels were to follow but the film itself is completely self-contained: the heroes escape, the dinosaurs commandeer the island, and that’s it. There is no need for a post-credits tag. The impetus for film studios to make blockbusters is – and has always been – to make a lot of money, but that doesn’t mean there can’t also be something beautiful about the idea of populist entertainment. Are there many cinematic enterprises more enjoyable than rounding up a group of friends to see an eagerly anticipated blockbuster, or cramming onto a sofa with your family at Christmas to watch that same film, out of your gourd on Quality Street? There’s a reason why blockbusters are often the first films people fall in love with. At their best, they provide a communal experience that combines spectacle with a satisfying narrative. As the spectacle overtakes the narrative, that unique joy is in danger of being lost. To read the original article at The Quietus, click here.